Perhaps it was the newspaper gene in me that made me screech my car to a halt when I saw a near riot in progress at my local total Toyota dealer. The showroom was more jammed than the unemployment office, with eager salesmen recalled from vacations manning card tables set up in every available space. I managed to grab one peripatetic salesman by a lapel, who gushed that they sold 45 cars yesterday, compared to ten for a normal Friday, and that 35 of these were due to the Cash for Clunkers program. Sure I could get a $4,500 credit for my 1995 BMW (17 mpg), and apply it to a new Prius (50 mpg), taking the price down to $19,500 and the monthly payment to $450/month for five years. In fact, the government stimulus program was so successful, that it ran out of money in the first four days, and congress rushed to triple it to $3 billion on Friday. It was like the survivors of a ship torpedoed at sea were swimming frantically for the only piece of wreckage that floated. Assuming that the average car drives 10,000 miles a year, and the average swap generates a mileage improvement from 15 mpg to 27 mpg, junking 750,000 clunkers will save 30 million barrels of crude a year, 1.5 days of our total annual consumption, or three days of imports. I asked to see the cars that were traded in and was told that the lots for the dealer, the used cars, and the detailer were all full, but I could see some if I went to the Target nearby where they were renting extra spaces. 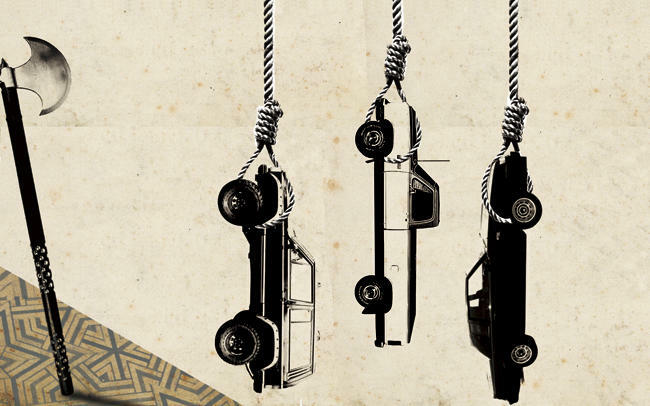 There I saw the fleet condemned to clunkerdom, GM Safari’s, Jeep Cherokees, Buick Regals, Dodge Ram pickup trucks and vans, and Chrysler minivans by the dozen, all with “CFC” marked on their windshields, a certain death sentence. These sorry excuses for transportation will never belch blue smoke, nor drip oil on our interstates again. I can’t imagine a sorrier commentary on the management failure of the US car industry for the last 30 years. This is actually a rather great program instigated by Congress, which has worked in Germany and other countries as well. As in Germany, many of the purchases were not for German cars, but went for fuel efficient models. Copy Cat initiative? Yes, of course! 30MM barrels of oil at US$70/barrel translates to US$2.1 Billion, lets assume the traded in clunkers would have been on the road for a minimum of another 5 years. We can see this program saves the American government from transferring up to US$10 Billion to regimes which may have disparate views as America has on freedom and democracy. Could Congress have placed a "buy American clause"? Yes! The money could be spent on any car assembled in North America. I hope this is implemented in the next phase. Would provide an incentive to Toyota and others to keep some of their plants open in the U.S.